We all knew that last year in Assam devastating flood has damage adversely in the district of Goalpara, Assam where thousands of family became homeless due to sudden flood. More than 70% people of the district had been suffered badly due to flood where many of among them have lost their life. It is difficult to imagine how natural disaster could become a devastating without being physically visited the affected site. We centre for rural development and local NGO Purbanchal Circle Goalpara jointly made a little effort to bring back those smiles in the faces of who have lost its glimpse in recent flood where many rural poor people of Goalpara district have lost everything whatever they had. To provided some assistance to affected people, we both Centre for rural development(CRD) and local ngo “Purbanchal circle” organized a Livelihood integration program in Agya,Goalpara district where different livelihood item were being provided to the affected people .Many affected people of Goalpara district have been covered under this livelihood integration program where hens, spinning wheels,etc were being distributed among them to carry their life forward once again after flood has left nothing for them.Mr Subhash Sarmah Board member of Centre for rural development(CRD) was attended in that programs where he expressed his view about how people should react in whenever such sudden natural disaster occurred and what are the immediate safety measure need to be taken in such scenario. 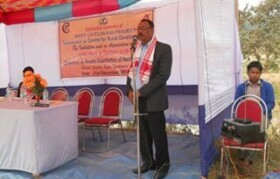 After that Mr.Pankaj Neog project coordinator Centre for rural development expressed his view about how such livelihood integration programs can make a huge positive impact on the society as well as affected people life without having any doubat.At the closing ceremony of the programs all the livelihood item had been distributed among the affected people by the Centre for rural development (CRD) representative and people shown their acknowledgement towards their little effort. 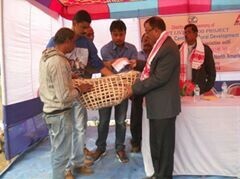 As per routine program the second phase of livelihood integration program was held at Goalpara district in the month of febuary2015.These programs main objective was to provide necessary support to the remaining affected people of the recent flood which took place in Goalpara district, of Assam. In that devastating flood more than 70 thousand people of rural Goalpara district had been affected badly and they have lost their everything. We Centre for Rural Development (CRD) and Purbanchal Circle had taken a joint initiative to extend our selfless help, support carry to those affected people who were being made helpless by recent devastating flood. More or less we have tried to cover almost all affected people under this livelihood programs through which we have try to make them economically sound once again after flood had taken away everything from them. In the second phase of the programs we have distributed same number of different, hens, spinning wheels etc to each and every remaining affected people. Its gives us immense pleasure to be part of such programs where full effort has been made towards uplift the socio-economic status of the poor rural people once again after recent flood has left nothing for them. In that programs Centre for Rural Development (CRD) board member Mr.Subhash Sarmah and Mr. Pankaj Neog coordinator Vikaspedia, have attended the program and shared their thought about such livelihood integration programs and its actual social motto. We Centre for Rural Development(CRD) have been observing world environment day every year on its birth day 5th June keeping in mind its relevant and important now a days where global warming has already make its impact on earth. 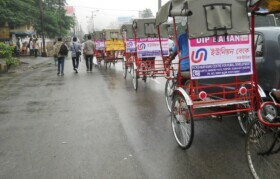 To create awareness as well as sending message to society about hygienic environment benefit we have been observing the day with more practical way organizing Rickshaw rally which is well recognized only environment friendly transport system in the world. Centre for Rural Development has always emphasizes on how environment can be protected in 20th first century which seems almost impossible to achieve in a modern era. We have organized a Rickshaw rally on that day where more than 300 rickshaw puller took part in that rally. 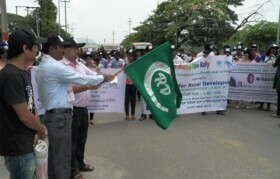 The rally was flagged off by GMC chairperson Mr.S.Biswanathan and it was started from Khanapara and concluded in Dispur last gate. There are many well known person who have took part on that really and their participants make these really even more fruitful. The rally actual motto was to send a message to the society about making pollution free environment which can be achieved by using like deep bhahan richakhaw which is one of the best fuel less convenient transport system in the world. We all know that our environment has been affected badly by pollution which is being created by different vehicle run in the road by the common people. Therefore we urge people to not use their vehicle on that day for at least one hour and contribute towards the healthy environment which is so relevant now a day. We all knew the real fact that the environmental problem are too big to be managed by individual or group but one should easily can take care of environment by many ways like planting trees, not using motor-vehicles etc.Centre for rural development has been trying to bring some changes in the societies by organizing such program where some effort was made by us to bring some awareness about important of hygienic friendly environment. 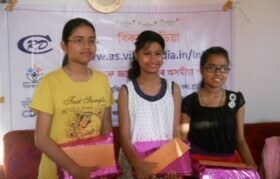 A essay competition was organizes by the Centre for rural development(CRD)on the topic of “Swachh Bharat”at Guwahati Dispur Government High School where renown different government school student took part in that competition. The mega essay competition was organized behalf of C-DAC Hyderabad where necessary proposal has been send to us to conduct the one essay competition on the topic of “Swachh Bharat” among the student. As per suggestion by C-DAC Hyderabad we left no stone unturned to make the competition a grand successful one where we have invited different school student to participate the competition. We have chosen a Dispur Government school as a venue for the competition where all the participant had been invitated.Overall 45 students took part in that competition and it was concluded nicely. Among 45 student essay the best three essays had been selected categorically and the said prize money had been distributed between them. The prize distribution ceremony was held at Centre for rural development (CRD) head office premises where all the winner contestant as well their guardian had been invited. All the student given thanks to the Centre for rural development (CRD) as well as C-DAC Hyderabad for their co-initiative to organized a such mega competition which given them opportunity to show their talent in a larger field. In 2013 CRD got a great opportunity to work with AFNA (Assam Foundations of North America) who is being pioneer partner of CRD in terms of providing financial help, support in different social development program in Assam. As a well wisher of CRD the AFNA had come with an idea to provide some fund to CRD where CRD has to utilized this fund in social mobility programs and CRD has always love to joined hand with such programs since its inception. After receiving the offer from AFNA, CRD family have initially decided to utilized some portion of fund in Morigaon district where DIPBAHAN rickshaw puller family as expected living their life without electricity in 21 century. 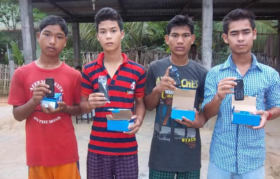 To give them some kinds of support in that regard CRD had given them one set of solar power system so that they can live a comfortable life with their family. Especially through this project we have tried to fulfill the requirement of the power to study in the night by rickshaw puller children which is badly needed by them for their better future. 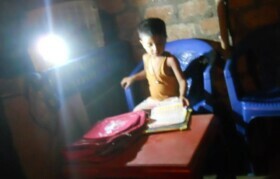 Therefore, we decided to provide them a solar power so that their children get adequate power to study at the night. Initially 30 families had been selected for these beneficiaries in Morigaon district where every beneficiary got a full set of solar power. 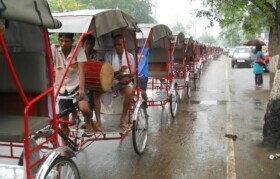 Finally CRD has decided to continue the solar project for rickshaw puller in entire Assam. The goal of this project is to help students in Assam stay in school, even when there is family financial hardship. To do this, we provide judicious monetary assistance and mentoring to the students in support from Assam Foundation of North America (AFNA). We work with schools that have dedicated teams with whose help we have selected needy students. The fund which we have received from AFNA is supported in an area where the poor and backward people children get some kind of help which they looking for. Therefore, we decided to provide a scholarship to those children who were economically poor and backward and their parent unable to give them any kind of support in their day to day life. So as per plan CRD had selected few educational institutions in Assam. From these institutions we have selected few students and given them a sum of money as a scholarship so that they can carry their study smoothly. Students from different poor family have been benefited immensely through these schemes. CRD has always been trying to help those sections of people who are poor and economically backward and needed help from society. India Development Gateway (InDG) is a web portal developed as part of the national level initiative, and dedicated to empowerment of rural India. InDG initiative is supported by Department of Information Technology, Ministry of communication & Information Technology, Government of India and executed by Centre for Development of Advanced Computing (C-DAC), Hyderabad. This portal is available in five different languages including Assamese, English, Hindi, Tamil and Marathi. For each language, there is a state nodal agency which is responsible for translating existing content in English-version and also collecting more creative writing means for development of common mass. 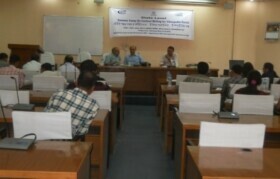 Since April 2010 Centre for Rural Development (CRD) is working as nodal centre for translating the site content into Assamese. As mentioned earlier CRD had beenselected by CDAC as a nodal agency to implement as well as introduced these e-portal project in entire Assam where series of workshop needed to be organized regarding Vikaspedia e-portal and related knowledge need to be shared with the respective people who are closely associated with the content of the Vikaspedia e-portal or knowing to use internet. 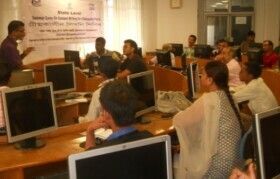 The main objective of this program is to introduce people about unique method of “Typing in Assamese Unicode” in the VIKASPEDIA e-portal where people can write article or information in Assamese language. Earlier it was not possible to write anything in internet in Assamese language but in VIKASPEDIA e-portal now people can easily write or read the content of the VIKASPEDIA in Assamese language which is so unique and innovative. CRD has already been organized and conducted more than 10 workshops till date in entire Assam and project is still going on. CRD family has been observing the World Environment Day every year on 5th June. We all are well aware about the fact that the global warming and severe climate changes have brought a serious concern to the entire human being in the Globe. Therefore in present time the developed countries are now giving more important to reduce motorized and engine driven vehicles on the road which have immensely contributed somehow on making a pollution free world. 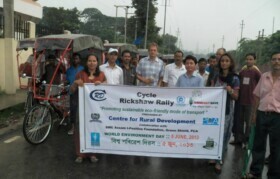 To carry forward these massages, CRD has organized a Rickshaw Rally involving 300 Dipbahan Rickshaw pullers to promote awareness about the pollution free environment which is equally important for good health in present days. The rally was started from Khanapara and it was concluded in Last gate .To support our rally many self help organization, political parties, student, renown person have come out to join our program and they given full support on it. Through these initiative CRD family try to bring some awareness among the people about the important of the healthy environment where common people have a serious part to play on it. Therefore every year CRD family celebrates the World Environment Day and tries to give a message to the society about the important of the environment which is being affected badly by our own act. 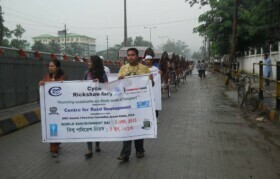 This year the Cycle Rickshaw rally was flagged off at Guwahati by Mr. M.K. Sarma the Chairman of CRD and Dr. Harry Barkema, Executive Director, Innovation Lab of London School of Economics, London was attended as Guest of Honour in presence of the Chairman, Members to the Governing Board and other dignitaries.